American aviation measures atmospheric pressure in inches of mercury, the rest of the world uses millibars. Unfortunantly microsoft forgot about this when they created the control tower and so although there is a setting in fsx to use hybrid settings the tower only shows altimeter. 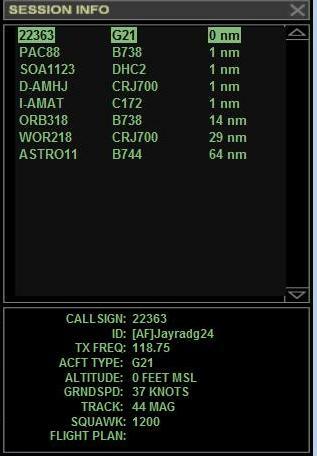 So I re-wrote the screen to include QNH, I also show QFE which should be given to anybody flying a VFR circuit. Clicking over QNH/Altimeter toggles between the two. Not a good example below as the airport is at sea level! Then I thought I'd rearrange the session screen so you could see 16 planes at once instead of just 8. Finally I thought I could hightlight someone pushing squawk ident by turning the aircraft red on the screen. 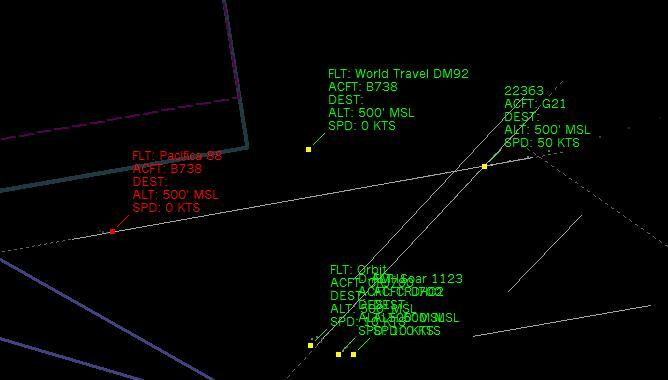 Download this radar.cab and overwrite the existing file in .....\Microsoft Flight Simulator X\Gauges. Note Last updated 23/11/08 13:30, fix to scroll problem when more than 16 planes in a session. As I've changed the height of the session window you also need to download this panel.cfg.